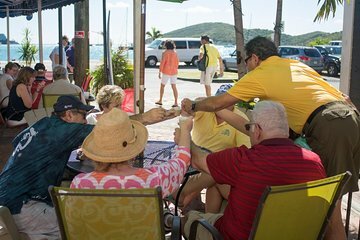 This tour allows you to experience the culinary culture of St. Thomas during a 2.5-hour walking tour. Indulge yourself with a Bushwacker, a must-try while visiting the island and stop at five eateries known for serving up must try local foods. Savor local favorites like scrumptious rum cake, curried chicken, ripe plantain and conch fritter. Visit historic sites such as the Hotel 1829, and a fort dating from the 1600s. All food tastings and beverages are included. If you’re the kind of visitor who likes to learn about the places you visit and live like the locals do, then this tour is for you! Stroll down the historic Main Street, which dates from the 17th century, on the way to the Fort Christian Museum. Learn about this remarkable red building, once used as a police station and the governor's mansion. Stop to see where the Emancipation Proclamation was read in 1848, now called the Emancipation Garden. Learn that the Danes used the 99 Steps to navigate St. Thomas' hills. Stop by several local restaurants serving local delicacies such as calaloo, fried pate, and local seafood. Your food tastings will be accompanied by the island's local Bushwacker, a frozen drink made from chocolate, coconut, and rum. After spending 2.5 hours walking the historical streets and having tasted many of the islands delightful cuisine, you'll end this tour with a deeper connection and appreciation for St.Thomas. Wonderful tour guide much food too much to eat all of it. We had a great time. Thanks so much. Our tour with Gerard was first rate. The restaurants were colorful and delicious. We were all too full by the end to do justice to our local dish of coconut curried goat. This was a first time experience for the four of us on the tour and we all agreed that goal was delicious and tender and very similar to pork. Give it a try and see a different side of St. Thomas. This was fun and full of history. Our guide was very informative. He know a lot about the history and culture of St. Thomas. The food was good. We ate a Glady's and a few other places. The server at Glady's was wonderful lady that was super pleasant. I recommend this, the walking is all relatively close together......you will enjoy. Gerad was very informative. Not just about the food, but about the city and the island. The food choices were excellent and gave a good feel for the local cuisine. Gladys' Cafe was worth a second visit for lunch the next day. Every stop was a treat and finishing with the Bushwacker was perfect. We really enjoyed this tour and highly recommend it. Gerard was an excellent guide and very knowledgeable about St. Thomas. The food was very good and some of the owners were very personable. 11 people on the tour were too many for all to hear the guide. Gerard was an excellent, informative guide who really cared about his island. We didn't know what to expect for a St.Thomas food tour, but both the food and the hosts were surprisingly wonderful! The only issue was that the meeting place was a little unclear. However, I was able to call and they pointed me in the correct direction right away. A highly recommended non watersport tour the next time you're in St. Thomas!